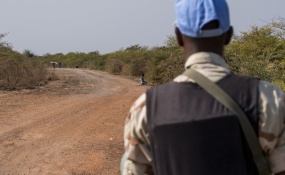 In this file photograph, an UNMISS peacekeeper patrols a road near Bentiu, Unity state, South Sudan. The United Nations peacekeeping mission in South Sudan has condemned a series of brutal sexual assaults on women and girls, travelling on the road to Bentiu, a town in the north of the war-ravaged country. According to the UN mission there, over the last ten days around 125 women and girls have sought treatment after having been sexually assaulted, as they walked along roads near Nhialdu and Guit on their way to the town near the Sudanese border. They were also robbed and beaten. The attacks were reportedly carried out by young men, some of whom wore civilian clothes while others were dressed in military uniforms. David Shearer, the head of the UN Mission in South Sudan (UNMISS), termed the attacks "absolutely abhorrent" and demanded that they must stop. "The violent assaults happened in a Government-controlled area and it has primary responsibility for the safety of civilians," he said. UNMISS has held urgent meetings with authorities and urged them to take immediate action to protect women and girls in the area and to hold the perpetrators of these terrible crimes to account, added Mr. Shearer. The head of UNMISS, who is also the Special Representative of the Secretary-General for the country, also called on armed groups in the area to "guarantee command and control" over their fighters to ensure rogue elements within their ranks are not involved in criminal acts. The UN mission has deployed patrols to the region to provide extra protection, as well as its human rights team to investigate and identify the perpetrators. Engineers from the mission are also clearing foliage from the sides of the road so attackers find it harder to hide while lying in wait. Now in its seventh year of existence, South Sudan, the world's youngest nation, has remained mired in instability and conflict, which has displaced millions from their homes. Earlier this year, President Salva Kiir and former Vice-President Riek Machar signed a new peace deal, and hopes are high that this will finally end the years of brutal conflict which have left millions homeless and hungry. Results of the agreement are still to be seen on the ground and many have cited a lack of trust between the parties as a key obstacle to peace.